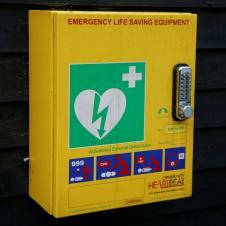 A defibrillator is located on the wall of the Duke of York public house. The defibrillator was donated by the Yorkshire Ambulance Service which owns and is responsible for its maintenance. To use the machine, dial 999 to obtain the access code. Instructions on how to operate the defibrillator will be given.